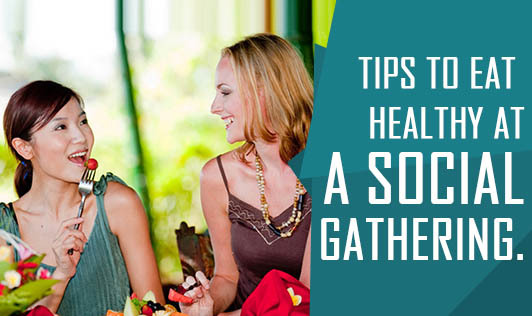 Tips to Eat Healthy at a Social Gathering. • Prepare in advance: When you are aware that you have to attend a social gathering, make sure you don't miss out your exercises. Eat foods that are low in calorie like fruits, salads and high protein foods like sprouts, fish or egg as they provide longer satiety. • Eat a bowl of salad before you head to the venue: A bowl of salad or a small snack before you leave home will help to keep your appetite low and your hunger less. • Start your meal from the fruit or salad bar: Fiber provides satiety and suppresses your appetite. So, always start by feasting on a variety of fruits and salads. At the same time, scan the variety of starters available. • Pick grilled/tandoor/baked starters: Usually the menu in social gatherings is full of fried items soaked in oil and desserts full of cream or ghee. It is sensible to choose grilled or tandoor snacks as they are low in fats. • Fill in your plate with healthy food: Fill your plate with a lot of healthy foods like fruits, salads, tandoor and grilled foods. Focus on interacting with your friends and relatives and enjoy your plate slowly. • Go slow on alcohol: Limit your alcohol intake as it just adds empty calories to your body without any nutrients. Accompany it with a salad and curd dip to regulate the effect of alcohol. • Cut down on the main course partly or completely: If you have followed all the above mentioned steps, then you would feel too full to indulge in a main course. If it is unavoidable, then you can have a small portion of rice and dal or roti with dal or raita. It is wise to avoid the gravies as they will be loaded with oil. • Desserts: When it comes to sweets and desserts, it is obvious that there are mouth watering varieties that may be hard to resist. There is no harm in trying a bite or two, but the problem begins when it increases. Controlling the amount you eat is important. • Food closures: To feel the completeness of a meal, eat paan, fennel (saunf) or any mouth freshener as a closure item. This will put you away from indulging in more food. And if you eat it before desserts, it will help you stay away from desserts completely. • Lemon water: A glass of plain lemon water aids in digestion after a heavy meal. Also try to take a small walk after your meal. Being a part of a social gathering is all about being with friends, relatives and socializing. It comes with several benefits, but the urge of over eating the rich food served at such gatherings is always a temptation. So, be prepared before you get there!